Definition at line 91 of file llscrolllistctrl.h. Definition at line 191 of file llscrolllistctrl.cpp. References LLImageProviderInterface::getUIImageByID(), mColor, mRoundedRectImage, NULL, LLUI::sAssetsGroup, sCount, LLColor4::setVec(), and LLUI::sImageProvider. Definition at line 220 of file llscrolllistctrl.cpp. Definition at line 240 of file llscrolllistctrl.cpp. References LLFontGL::BOTTOM, f, FALSE, LLFontGL::getLineHeight(), LLUIString::getString(), LLFontGL::getWidth(), LLUIString::getWString(), gl_segmented_rect_2d_tex(), glColor4fv, LLFontGL::HCENTER, LLFontGL::LEFT, left, LLUIString::length(), llround(), mColor, mFont, mFontAlignment, mFontStyle, mHighlightCount, mHighlightOffset, mRoundedRectImage, mText, LLColor4::mV, mWidth, LLFontGL::render(), LLFontGL::RIGHT, S32, S32_MAX, and TRUE. Definition at line 100 of file llscrolllistctrl.h. 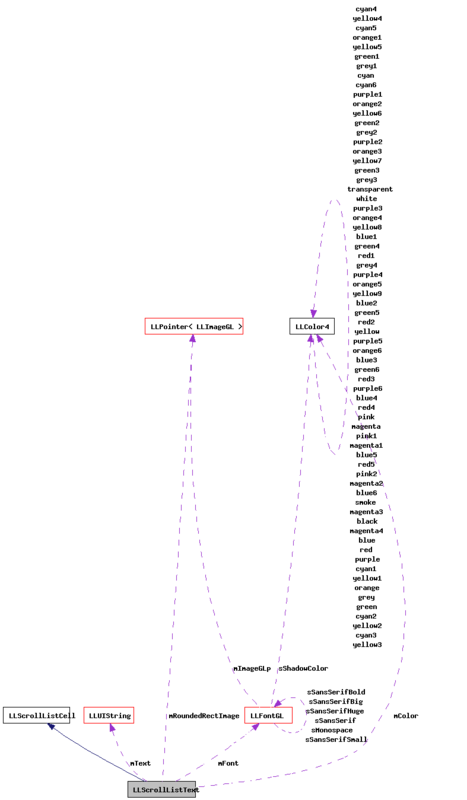 References LLFontGL::getLineHeight(), llround(), and mFont. Definition at line 101 of file llscrolllistctrl.h. Definition at line 102 of file llscrolllistctrl.h. Definition at line 98 of file llscrolllistctrl.h. Definition at line 103 of file llscrolllistctrl.h. Definition at line 106 of file llscrolllistctrl.h. Definition at line 226 of file llscrolllistctrl.cpp. Definition at line 235 of file llscrolllistctrl.cpp. Definition at line 99 of file llscrolllistctrl.h. Definition at line 111 of file llscrolllistctrl.h. Referenced by drawToWidth(), LLScrollListText(), setColor(), and ~LLScrollListText(). Definition at line 110 of file llscrolllistctrl.h. Definition at line 113 of file llscrolllistctrl.h. Definition at line 112 of file llscrolllistctrl.h. Definition at line 116 of file llscrolllistctrl.h. Referenced by drawToWidth(), and highlightText(). Definition at line 117 of file llscrolllistctrl.h. Definition at line 119 of file llscrolllistctrl.h. Referenced by drawToWidth(), and LLScrollListText(). Definition at line 109 of file llscrolllistctrl.h. Referenced by drawToWidth(), getText(), and setText(). Definition at line 115 of file llscrolllistctrl.h. Definition at line 114 of file llscrolllistctrl.h. Referenced by drawToWidth(), getWidth(), and setWidth(). Definition at line 121 of file llscrolllistctrl.h. Referenced by LLScrollListText(), and ~LLScrollListText().